Today I received the most beautiful photos from a friend whose young niece was reading my book to her. Adorable – AND smart! She knows good poetry when she sees it! That’s raising her right. A+ parenting! No prizes for guessing that the pastor wasn’t expecting that. Meeting Politicians the ‘Strayan way. It’s been a funny old day in Australian politics. On the front page of the national newspaper today was a picture of Tony Abbott, Prime Minister of Australia, being “bunny-earsed” by some kid at a reception for the Diamonds, the Australian representative netball team. I really enjoy this picture, because it looks like it’s Bill Shorten, Leader of the Opposition, doing it. That would be funny, too, although perhaps a bit harder to justify as an innocent prank. The second picture definitely shows that it’s a kid’s arm behind the PM. Personally, I think someone should give that kid a knighthood, or at least a medal. With one gesture, he has summed up the feelings of many Australians. Moreover, it’s humorous and typical Aussie larrikin behaviour, without causing any harm or any significant disrespect. 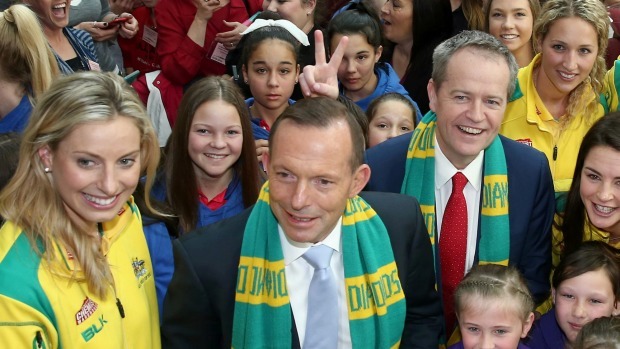 Let’s face it, giving someone bunny ears in a photo has been the Australian way for generations. How many years worth of school photos do we all have where someone is doing the bunny ears, or crossing their eyes, or wearing someone else’s glasses? Those are the things that make actually getting those photos taken worthwhile. It’s also a reminder that we are very privileged to live in a country where we can meet and mingle with our national leaders without getting tasered or spear-tackled to the ground and, in the case that we should survive that, arrested. I can’t imagine being able to get close enough to Vladimir Putin, or Kim Jong Il, for example, or daring to “bunny ears” either one of them. And taking on the POTUS bodyguards? No. No thank you. I’ll be good. Australia really is a great country. It’s a great place to live, especially if you’ve got a bit of a sense of humour and don’t take yourself, or your politicians, too seriously. Just making sure we knew. Me: you just asked that so you could say you would check on your iPad in front of everyone, didn’t you? At least she had the dignity to blush. Two boys ran to the door of the library and looked in to see which teacher was on duty. Both looked at me with a mixture of misery and disgust on their faces, then walked away.